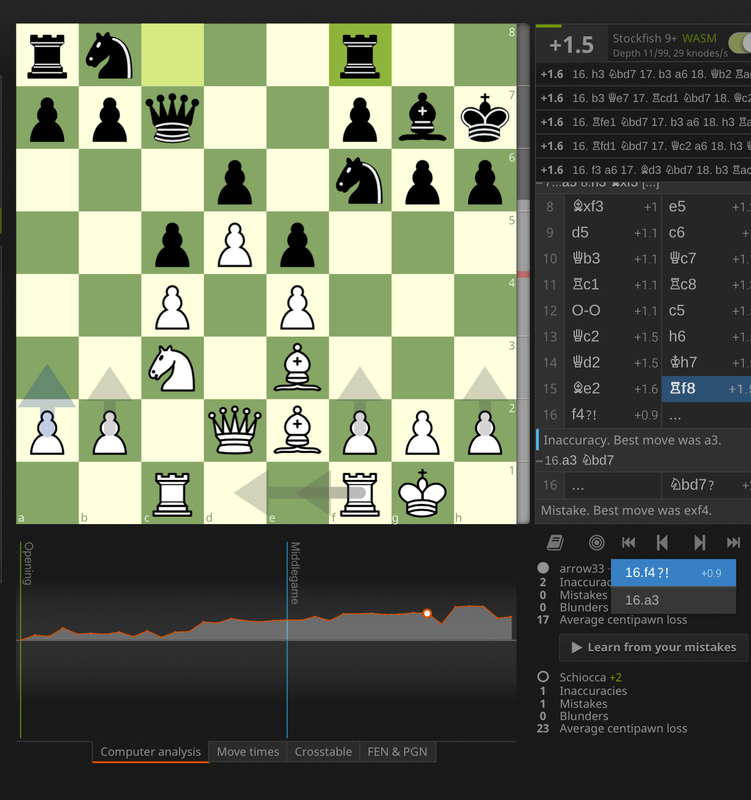 Yesterday I played a game chess whose link is: https://lichess.org/rnLeeqMD/white#30 The computer tells me that in the 16th move,when I played 16.f4, I made an inaccuracy. -if Black captures the pawn, the file f file will be open for the rook. Besides the d6 pawn will be become weak and susceptible to be attacked right away via Bf4 and Nb5. -If Black does not capture the pawn, I can still exchange my pawn so the file gets open. However, in both cases, I allow my rook to go to f3 to later move to h3 where along with the other bishops it would exert comsiderable pressure on the kingside. -My bishops amd Queen point to the kingisde so I think I should attack that part of the board. Maybe my white bishop square is not the best but it does not look probable that my e4 pawn can easily be exchanged or sacrificed so this bishop can effectively go to d3. -Because Black’s knight has not moved yet I do not want to give any time to Black for them to make that move. So a move like f4 forces Black to move another thing. Exactly for this, I am surprised that the computer suggests taking a slow course of action by preparing a rupture via a3-b4. The other suggestions I am given such as playing f3 do not convince me much because although it protects the e pawn, it blocks the white bishop whoch already had a bad outlook on the square it is. Playing h3 is I think too slow although it prevents a junp from the knight to g4. Could someone tell me what I got wrong in my analysis? White has a big advantage in this position because of her space advantage and her bishop pair. All Black's minor pieces are very passive with no good square to aim for. After 16.f4?! ef4 17.Bf4 Ne8 (or 17...Qe7, side-stepping any Nb5 attack), intending Nb8-d7-e5 White is still much better but Black has a great outpost on e5 for one of her knights, and the open h8-a1 diagonal for her bishop. Probably White will need to swap at least one piece, which is a minor but definite success for Black. Also, in the long run, the backward Pe4 may become blocked and weak. If White cannot exploit the opening on the position with a direct thrust (such as Nb5 or e4-e5), she better refrains from 16.f4?! altogether. On the other hand, a good constructive plan could be to prepare g2-g3 and f2-f4, intending to take back with Pg3 in case of ...ef4 : That way White would keep control on e5 and a dynamic pawn pair e4-f4 that will constantly threaten to advance further. What are the benefits of playing 1. h3? Was the value of thorn pawns fully appreciated in decades past?